August 6, 2013, 2:30 PM · Just a few weeks ago, violinist Augustin Hadelich had a crowd of nearly 10,000 people going wild over the Tchaikovsky Violin Concerto at the Hollywood Bowl in Los Angeles. In June, he recorded the Sibelius Violin Concerto and "Concentric Paths," the violin concerto by Thomas Adès, with the Royal Liverpool Philharmonic and Finnish conductor Hannu Lintu for the Avie record label. But among these bold achievements is a gem of a recording that he released in the spring, a collaboration with guitarist Pablo Sáinz Villegas that explores the quiet combination of violin and guitar: Histoire du Tango. Who knew, that the guitar fits so authentically as a partner for pieces such as Sarasate's "Zigeunerweisen" and Paganini's "Moses Variations"? 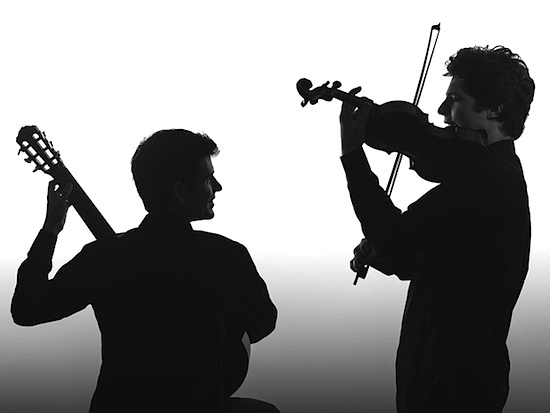 The pair also uncovered a "Sonata Concertata" that Paganini wrote for guitar and violin, one of the few that gives both instruments equal roles. And as far as the tango is concerned, the two performed a fiery version of Piazzolla's 1986 Histoire du Tango. The piece was written originally for flute and guitar and traces the history of the tango, from the bordello to the modern concert hall. Manuel de Fallas' Canciones Populares Espanolas, originally written for guitar and voice, is also included. I was a little surprised to learn that this was not Augustin's first collaboration with a guitarist; in fact, the first one occurred long ago. Laurie: Tell me a little about your very earliest experiences of playing violin with guitar. Augustin I was about seven years old, and I was living in Tuscany on a farm. I'd just been playing the violin for a few years, and a guitarist came to visit our village. He had an arrangement with him of Sarasate's "Zigeunerweisen" (for violin and guitar), so we played it in a performance at the village church there in Italy. I actually played "Zigeunerweisen" with guitar before I ever played it with piano! I feel that it definitely works. In the piano and orchestra versions, there are places where the piano, or orchestra, is supposed to imitate somebody on the guitar, strumming. The orchestra version is the original, and of course, when you play it with orchestra, that is a great sound; it's quite fun. However, when you play it with orchestra, you have to play much more 'in time,' and it limits the kind of rubato you can do. Laurie: I had not heard "Zigeunerweisen" with guitar! The other piece from this album that I had never heard with violin and guitar was the Paganini "Moses Variations." It gave it a really different flavor. Augustin Originally, it was written with orchestra. The orchestra parts are all in E flat minor because Paganini played it scordatura. He actually would break the other three strings at the end of the previous piece. Because of the change in tension that the instrument would experience, the remaining string, the G string, would go up a minor third, so it would actually sound as a B flat. Augustin So the way to play the scordatura is, you tune the G up to a Bb, and then the whole thing is a minor third higher. The problem is, it's horrible to do that kind of scordatura on an old violin; it's really tough on the violin. Also, if you take a G string and you tune it that high, it's going to sound awful because the thickness of the string will make it sound bad. I know people who have done it, who will say you should take an extra-thick D string and put it where the G is and tune it down. Laurie: And take off all the other strings? Or leave them on? Augustin I think you should really leave them on -- the soundpost might fall over! Nowadays it seems like a ridiculous thing, but back then, it was more of a circus act. His concerts were these huge events. He probably didn't play the piece in every concert, but when he did, he would find a way to break his strings, or to make a show out of finally being really frustrated and breaking them himself. Laurie: How on earth did he do that, did he have a razor blade in his pocket? Augustin He had gut strings, and it's pretty easy to break gut strings. I don't know exactly, but he's one of those artists who would be most interesting to have a video of the performance. All the stories about him are so exaggerated! Imaginations were running wild. Everyone was fainting and people were really hysterical in these concerts, so I wonder how much is really true. But I think he wrote this piece so that there was really no doubt that he was playing it all on one string. Laurie: Do modern violinists play it all on one string, do you play it all on one string? Augustin Yes, and it's actually very well-written, I must say. There are moments in it that aren't fun at all, going that high up on the G string. So you have to do it on a violin that doesn't have a big wolf. If it's really wolf-y up there, you can't play this piece, basically. But other than that, considering that it's all on the G string, it actually lies pretty well. Harmonics are useful. I think if you go on the D-string, you hear the color change. I think people would catch you. But the piece itself is beautiful. It's themes by Rossini and it is totally in that operatic style. All Paganini's music is so influenced by Rossini, and a lot of his showpieces are theme and variations of opera arias that were famous at the time. The piano part has a very guitaristic pattern, actually. It's the kind of accompaniment you give to other instruments so that they sound like guitar. Laurie: While we are on the topic of Paganini, I don't think that everybody realizes that he also played the guitar. Augustin He played the guitar very well, apparently, and then he had a guitar student who was also his lover in some way. From looking at a lot of the pieces that he wrote, I'm assuming that he wrote these for them to play together. She wasn't great at the guitar, so the guitar parts are pretty simple and easy, and the guitar is mostly accompanying. So whenever you play with a guitarist and you suggest playing Paganini together, they're not so excited about the prospect, because it's so boring for them to play a lot of it! So (Pablo and I) looked through the various pieces Paganini wrote. There are also these small sonatas he wrote, in one or two movements, I think there are two cycles of six, I'm not sure, but there's a ton of stuff that he wrote. The quality of the writing is a little uneven; they're not all equally good pieces. And Pablo (he laughs), he just didn't want to do it! And then I discovered Paganini for Two, a great recording by Gil Shaham and guitarist Göran Söllscher that they did in the 90s. It's all Paganini music; that's where I got the idea of doing the Sonata Concertata -- it's on that disc, and I thought it was a good piece. I like the "Sonata Concertata" because the guitar has a major role. It is a real duo; the two instruments are really equal. It's very classical. It's also not what one thinks of when one thinks of Paganini because it just doesn't have any virtuosic fireworks in it at all. But it does have other things that are typical of Paganini: the themes are very Rossini-like. It's basically early Romantic, almost classical, the way that Rossini writes. And he gives the guitar chances to shine. Pablo's sound is very well-suited for it. This was something I was very excited about when I met him, I was struck by the sound, because it's very sweet, very lyrical. Many guitarists, when you listen to them, there are moments when the sound gets sort of metallic, or you hear things, taps and shifts. Pablo's sound is very beautiful and well-suited for this classical music. The Paganini, in soma places, it is like Mozart. Laurie: How did you meet Pablo, and what is it like to work with guitar rather than piano? Augustin We first met in 2009 through a mutual friend who was the German consul in New York at the time. He knew both of us, and he kept telling me, 'You have to play with Pablo,' and I said, neeeya, whatever. But then I met Pablo and I got really into the idea. So we did a recital together and we started to make some plans. What's different about playing with guitar, aside from some of these pieces being music that's never played at all and stylistically different from what I've done before, what's different about playing with guitar is the way the two instruments are balanced. The sound of the guitar sustains much less than a piano does, so it's quite tricky. You have to play things differently. In concert, you can easily cover the guitar -- not a problem I'm used to! With the piano, it's always the other way around. So that's one thing to watch out for. Also, the sound of the guitar decays differently. So if we're playing a chord together, and it's supposed to sound like one chord -- chamber music is always full of places like that, where people are trying to sound like one instrument playing a chord together -- that's where decaying like the guitar becomes important. What's nice about recordings is that you don't have to worry about balance too much as you play; somebody engineers the balance. You just do whatever feels right to you, but then whoever is sitting there adjusts the levels, which is nice. The guitar never has to force. Also, I think he had not played with with a violinist before this. He had done the da Falla before, but with a singer. So it was a new experience for him, but it was good fun. Laurie: I understand you took tango lessons -- were these lessons about how to play tango, how to dance the tango, or a little bit of both? Augustin Well it's pretty embarrassing. It was in about 2007, and it was mainly my manager's idea: maybe you should start dancing, and it will improve your stage presence -- that sort of approach. So I started taking tango lessons from a tango teacher here, who is also a tango violinist: Leonardo Suarez Paz. Then I discovered later on that he is the son of the violinist who was in Piazzolla's quintet, and he had all these connections to Piazzolla! But these were dancing lessons, so I was trying to dance the tango, which is very difficult. Later on, when I did actually play tango music, it was helpful to know. Of course, Piazzolla's tangos are not tangos that you're going to dance to in a tango club! But still, the feeling of the steps and the way of Argentinian tango is very fluid. Having tried to do that and practiced that, I must say, was helpful. But I'm not any good at dancing! As a musician, it's not too hard to understand the rhythm and character of the music; my problem was the actual physicality of it -- I'm too awkward! So I won't quit the violin to become a tango dancer. But for probably a half a year I went for lessons, every two weeks or so. Laurie: I think it's a great idea. I'm of the mind that violinists should learn to dance minuets when playing Bach, and it would be great if we all knew how to dance a gigue, just get those feelings, even if it's something we're not destined to be great at. It makes a difference in how you feel the music, I think. Augustin It's harder with the old dances, because we're reconstructing them from written documents. When I was at Juilliard, I took a class on Baroque dances. But I was always thinking, how do they know that these dances looked exactly like that? It's so much more removed. It's incredibly easy with tango, because you can pick so many videos to watch. The tradition is still alive. And a lot of folk music is very easy, for the same reason. With the Baroque dances, there are no videos. But what it does, when you study these dances, is it shows you how the music is structured rhythmically. What are the strong beats? Are the beats all equal? Things like that. If you just look at the score, you don't know those things. But when you study the dance, you learn that in the Sarabande, the second beat has an emphasis. It makes sense, once you know. Or in the Viennese waltz, the three beats are not the same, the first beat is shorter than the others. It comes from the way it's danced, the motion. And you have to do it. If it's really a Viennese waltz, it has to be there. So if you are playing something that's a dance, it's definitely important to know where it comes from and how it's danced; what's the spirit, the character, the beat.